Everyone’s building their own Steam competitor, and Bethesda is no exception. Rage 2 pre-orders went up last night, but only on the Bethesda.net Store, and the game still doesn’t have a Steam page. You might’ve expected this given that Fallout 76 launched exclusively on the publisher’s client, but now it seems certain Bethesda games going forward won’t be coming to other stores. You can pre-purchase Rage 2 at the expected price of $59.99 USD. Or you can spend $20 to grab the Deluxe Edition with the Doom BFG, a ‘progress booster,’ and some ‘Wasteland Wizard cheat codes,’ along with an extra mission and a future ‘campaign expansion’ called Rise of the Ghosts. If you want the even more expensive collector’s edition, you’ll need to head to a proper retailer of physical goods. We’ve reached out to Bethesda for confirmation that Rage 2 will remain exclusive to the company’s launcher, but haven’t gotten a response. But after Fallout 76 came exclusively to the Bethesda launcher, it’s looking like a safe expectation. While Steam’s revenue split seems to have been an effort to entice big games to stay on Valve’s platform, it’s apparently not quite enough for Bethesda. Epic, EA, and Activision have all split with Steam, and while some of those clients have had tough time getting up to decent standards, it’s all worked out in the end. But the Bethesda launcher’s issues are much more recent – like that time you couldn’t uninstall the Fallout 76 beta without buying the game. 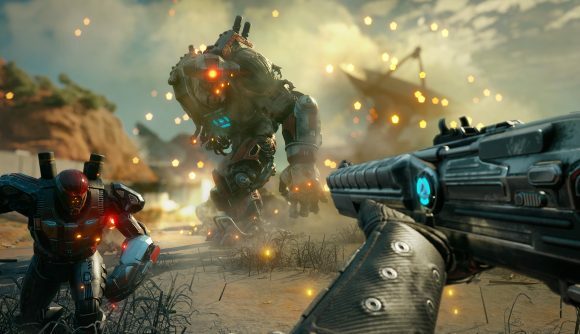 The Rage 2 release date is set for May 14, 2019, and you can follow that link for details on what to expect from the big collaboration between Avalanche and id. You know, as long as you’re not an absolute Steam diehard.